If you are a prospective client and have some questions, you may just find the answer below. If you have any additional questions, please drop me a line at jennifer@fixyourimages.com. How do you stand apart from the competition as a pet photographer? If you search online for Kansas City dog photography or Kansas City pet photography, you will find my website number 1 in the search rankings on Google. My work has been seen on the cover and inside features of 435 South, Pet Home and Dog Living Magazines. My pet photography has also been published in Dog Fancy, Life + Dog, Fido Friendly, Bella DOG, Kansas City Fitness, and Metro Pet magazines. My work has been featured on the covers of Happy Tails Books. Click here to read client testimonials. What photography do you specialize in? I specialize in natural light pet photography and photo restoration. I also specialize in Going with Grace© sessions which honor and celebrate the lives of aging and critically ill pets. I am available for engagement and wedding photography (by special request only) where pets are encouraged but not required. I also recently expanded my services to offer maternity, newborn and child photography. You can learn more about those packages here and see photo examples here. Be sure to read my article and interview with a local dog trainer about pets and child safety if you plan to include your pets in these shoots. Why should I choose custom photography? Custom photography is an investment in images that preserve memories and capture your loved ones as you really know them, and with proper care these images will last a lifetime. As an experienced and nationally recognized pet photographer, I create unique and timeless images that show your pets true personality and soul. How much are your sessions? Please e-mail jennifer@fixyourimages.com for full details regarding pricing and options. However this information is summarized on the “Book a Session” tab here. I am worried my dog will not behave or will be camera shy. Do you have experience with this? Don’t worry, every dog owner feels the same way! However please know that I chose to specialize in pet photography because I form special connections with dogs and have the ability to capture their unique personality. Every dog I have worked with has been comfortable with me and the camera, regardless of their personality, size or breed. I will get to know your pet and be sure he/she is used to me before I start pointing a camera at them. Many clients have been very surprised how fast their shy or cautious dogs have warmed up to me. I volunteer regularly at animal shelters and rescue organizations and have experience with many different personalities and breeds. Will you allow me to be in photos with my pet too? Sure! You are welcome (and encouraged!) to be in the photos with your pet, and I will almost always capture you and your pet’s bond when you don’t even realize it – allowing for the most raw and intimate moments to shine through. Please visit my Puppy Love gallery on my website to see the types of images I create of pets with their owners. What can I expect during the session? During your pet photo shoot, you and your furry friend can expect a time full of laughter, bonding and joy. Your pet will receive some yummy treats in exchange for their cooperation with this silly photographer lady! I have a great amount of patience with the pooches and will follow them around and capture them in their true element and not overly pose your pup. I will not immediately cut off the session as soon as we are close to the ending timeframe. Sometimes it doesn’t take long at all to get a collection of great shots, but every dog is different and I have the patience to wait if necessary and ensure I have a variety of photos showing your pet’s personality. I define my personality as “Type A”. Wikipedia describes this type as a “high-achieving workaholic who multi-tasks, drives themselves with deadlines, and is unhappy about delays.” This most certainly describes my work ethic. I only book one session per day, so I can dedicate all my time to you. Images are all taken through a detailed post processing process to ensure the highest quality results. You will receive an e-mail with a link to your password-protected gallery for viewing purposes within 3 days from the date of your session. Images will be available to view for 2 weeks from the date of your session. Once you decide which photos you would like to order in digital or hard copy form, send an e-mail to jennifer@fixyourimages.com with this information. Do you only offer outdoor photo shoots? I prefer outdoor photo shoots, usually at local parks or in the backyard of your home. I am open to suggestions though. I would also be willing to photograph your pet indoors, assuming there is a substantial area of natural light available. Cats can be photographed on a sun porch if you prefer them to be confined. You can conveniently request a booking at my website by clicking here. Once your booking is approved, you will receive an e-mail confirmation and a prompt to pay a 50% deposit online to secure your date. I am available most weekends and also weeknights after 5:30 upon request (depending on the season for adequate natural light). If your photo shoot is rained out, I will reschedule your session on another available day. Gift vouchers can be purchased online and are redeemable up to one year from the date of purchase. What should I bring the day of the photo shoot? For pet photo shoots, feel free to bring their favorite toy and/or treats. I will bring treats as well, but if your dog has a preferred treat, it never hurts to bring it along! If your pet is a fashionista, feel free to bring any clothing or accessories you would like them to wear. Most importantly, just bring yourself and your furry best friend and be ready for a good time! What type of payment do you accept and do you offer refunds? I accept check or cash, due at the time of service. I accept credit card payments which can be processed online in advance before the photo shoot. I also accept credit card payments for print and product orders. Payment is in exchange for my time during the session and post processing artistry expertise. There are no refunds offered for services or goods. I will travel within the Kansas City area to the outdoor location of your choice or an indoor location if natural light is available. If you live outside of the immediate Kansas City Metropolitan area, I would consider traveling to other cities and states for an additional charge. P.S. 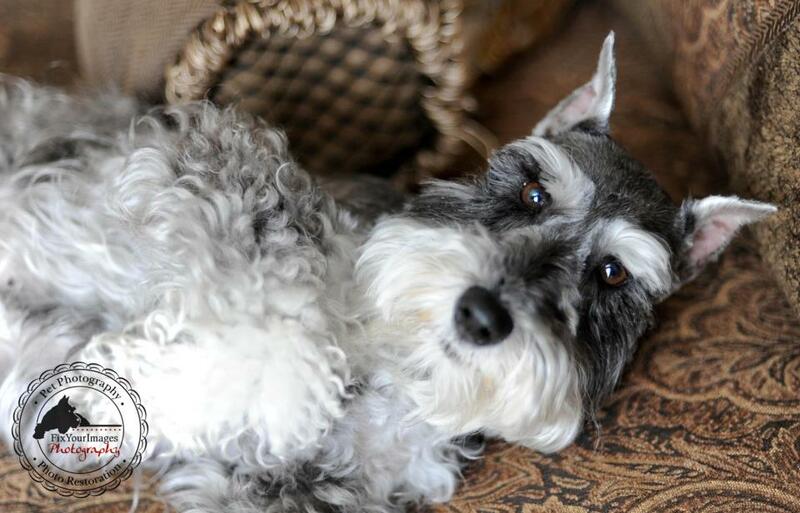 – This post was Remington Schnauzer approved!